Lying near the mouth of the Singapore River, the site of Clarke Quay was the centre of commerce during the late 19th century. Today, Clarke Quay is still buzzing with life and activity. The waterfront godowns now play host to a colourful kaleidoscope of restaurants, wine bars, entertainment spots and retail shops. The bustling market atmosphere of bygone days comes alive amidst the rows of charming shophouses, pushcarts, and five-foot-way merchants. Today, Clarke Quay is a delightful mix of modern and traditional. A reminder of its rich heritage is reflected in the vibrantly orchestrated concept. 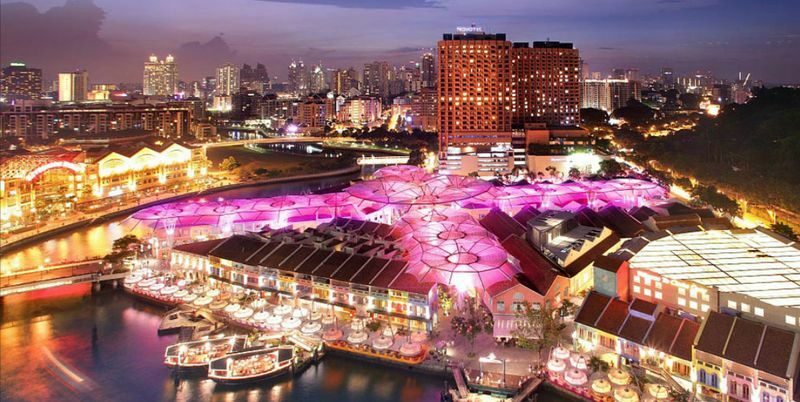 Their vision - an innovative approach which boldly reflects the heritage and charm of Clarke Quay. Find out about the different factory processes involved in pewter making at the Royal Selangor Process Demonstration Tour. Then drop by the adjoining store to shop for the latest pewter designs. A unique experience is the Royal Selangor's School of Hard Knocks course, where you will learn how to create your very own pewter dish. You'll even be presented with a certificate and your very own pewter masterpiece. Adrenaline seekers will want to try out G-Max Reverse Bungy - Singapore's first and only reverse bungy. Direct from New Zealand, the open-air capsule catapults you to a height of 60 meters at a staggering speed of 200km/hr. for an easier ride, hop onto a traditional trishaw and take in the spectacular views. Or cruise down the historic waterways in an authentic bumboat for a rare glimpse of old shophouses and godowns.